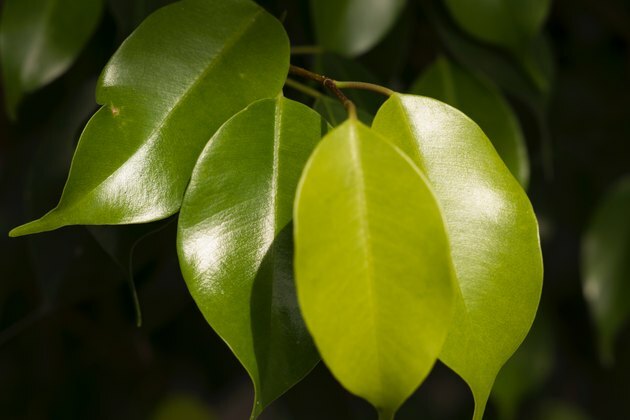 The ficus tree (Ficus benjamina), also known as the weeping fig, stands out because of its glossy leaves and arching branches. Noticing your ficus tree leaves turning yellow? It could be because of the care or environment. This plant requires bright, indirect light and regular watering to thrive. Any environmental stress, such as under watering or cold drafts, can cause ficus tree leaves to yellow and then drop off. The leaves will almost always regrow once the underlying cause of the ficus dropping leaves is eliminated. Ficus trees require regular watering. If you let your plant dry out, it may respond by shedding its leaves. If your ficus plant is under watered, its leaves will turn bright yellow all over the plant and then drop off. Fix the problem by watering your ficus tree every time its soil dries out to a depth of an inch. Water the plant thoroughly, aiming to soak the compost completely. Allow all excess water to drain away after watering. Too much water can also cause weeping fig yellow leaves. If your ficus tree has yellowing leaves or is losing leaves from its branch tips, it is likely over watered. Let the top inch of soil dry out between watering, and make sure your plant's pot is not standing in a dish or saucer of water. Simply moving a ficus tree from one room to another can be enough to trigger a bout of leaf yellowing. If the light intensity or temperature in the new location is different, then the water requirements will change. Leaf yellowing and drop caused by moving a ficus tree are often temporary, and the leaves will grow back after the plant adapts to its new conditions. A cold draft or warm air current caused by an open door or heater can trigger leaf yellowing in ficus trees. Check the surroundings of a ficus tree with yellow leaves to see if anything has changed. Spray ficus plants regularly to maintain local humidity levels and reduce the chances of leaf yellowing. Ficus trees need temperatures above 55 degrees Fahrenheit but thrive at daytime temperatures of around 70 degrees Fahrenheit. Ficus trees need regular fertilizing once a month using a general-purpose fertilizer to ensure healthy growth and leaf production. But too much fertilizer can cause a buildup of salts in the soil. This will cause the older leaves on a ficus tree to yellow and drop off. If this happens, water the ficus tree thoroughly until water drains out of the bottom of its container. If you notice a white, crusty residue on the surface of the soil, immerse the whole pot in a bucket of water to leach out excess salts. Giving a finicky ficus what it wants helps minimize yellowing and dropping of leaves. Pinpointing the problem can help you correct the issue so your leaves turn back to the bright, shiny green you love.